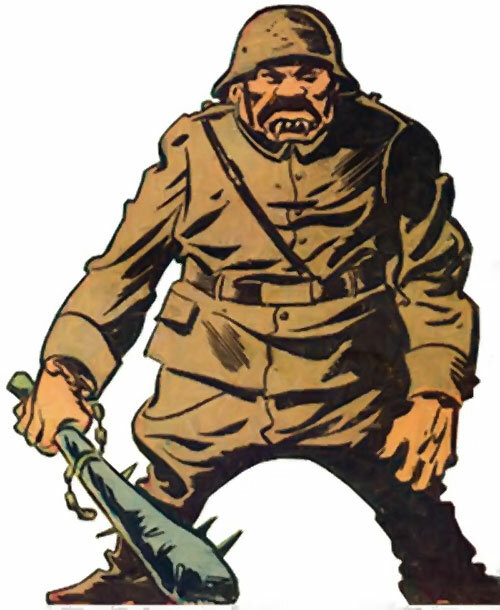 Captain Nippon appeared in 1942, in Captain Marvel, Jr.. He’s a good example of the racist war propaganda that can be found throughout 1940s US comic books. This entry is best read after the Captain Nazi (1940s) character profile, since Nippon is but a variant over him. But with more racism. So much racism. Group Affiliation: Imperial Japan ; Jamambux ; Black Dragon Society. Base Of Operations: Imperial Japan. Height: 6’ Weight: 240 lbs. In most appearances, Nippon is a super-strongman. He can easily destroy most man-made things and ignore all attacks short of artillery. 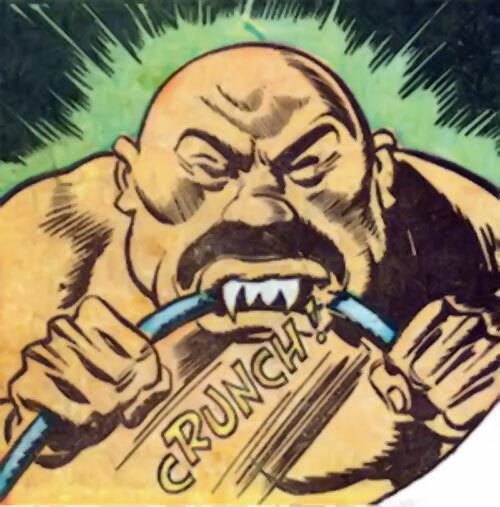 Nevertheless, he’s completely outclassed by Captain Marvel or Captain Marvel, Jr.
A distinctive feature are his fangs. He can use these to chew through solid steel. Nippon collapsed entire buildings by destroying the load-bearing girders through mastication. 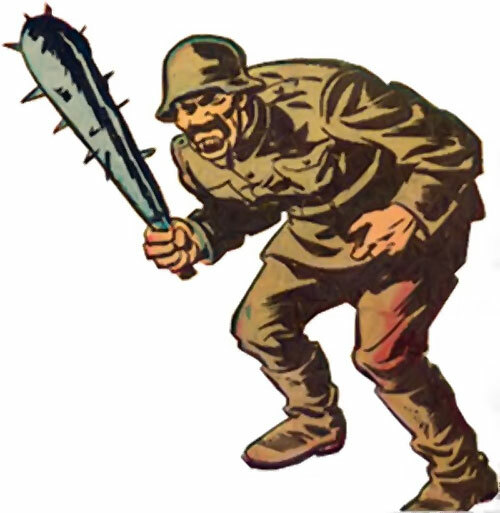 Like Captain Nazi’s, Captain Nippon’s Hero Points are almost solely used to withstand (LDD) the first punch from a Marvel, then try to escape. He just hoards what he has for his next, inevitable encounter with a Marvel’s fist. 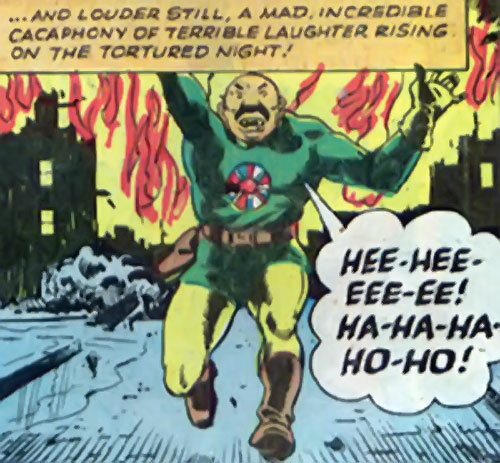 Captain Nippon and his masters are of course enthusiastic torturers. Yet they inexplicably use Medieval European tools and techniques such as iron boots or iron maidens. One of Captain Nippon’s few salient traits are his teeth. Or rather his fangs, since they are clearly animalistic. This dentition is a further exaggeration of the way “the Japs” were caricatured in 1940s American propaganda. Japanese men were depicted with tiny slit-like eyes (often diagonal), pale sickly yellow skin, huge buck teeth (often with the two front teeth being freakishly large and extending past the lower lip) and, more often than not, small round glasses with very thick lenses. Thus, Nippon’s most distinctive ability is the power of augmented racist caricature. Which does give one pause. This racist shorthand to drawing Asian men was around well before WWII. For instance, it can be found in xenophobic pamphlets and Yellow Peril literature during the late XIXth century onward. It also often was used to depict Chinese workers in the US. It still exists, though in a less pervasive way than it once did. The thing with the eyes and the skin is straightforward caricature insisting on ethnic differences in features. But the teeth thing is more puzzling. Of course, it serves to make the characters of other races seem more animalistic (which is particularly evident in Captain Nippon), but its roots are not clear. It is possible that it comes from a dental condition known as shovel teeth. While it is rare among the various Asian populations, it is practically non-existent among European ones. 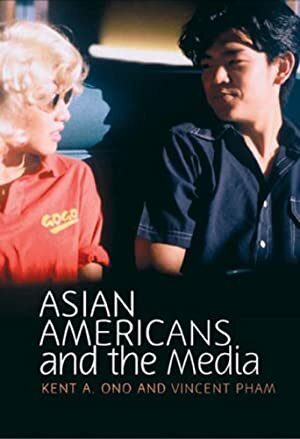 Popular imagination may have latched on this rare but distinctive case as a descriptor for their “Asiatic men” mental category. If so, this would resemble how other puzzling racial clichés are born from tiny samples. Such as all English persons having bad teeth, all Frenchmen wearing striped shirts and selling onions, or all Irish folks having red hair. One would assume that are also thrown in some clichés about “Orientals” smiling politely, and some comparisons with rats. The latter tends to be a common component of racial/moral purity screeds comparing this or that group to a spreading disease. Hence rats, as a parallel with plagues. Racist imagery tends to be pretty twisted balls of hatreds, xenophobia and insecurities. These tangle with each other. But successful ones end up creating an image that resonate on enough levels to achieve the lofty status of a platitude. Captain Nippon is a sort of golem. He was built and animated by Imperial Japanese sorcerers serving Emperor Hiro Hito. Originally, these sorcerers are called the Jamambux, and the Emperor describes them as his “secret society of medievalists”. But they will later be referred to as the Black Dragon Society. The Black Dragon Society was a real-world organisation (but a paramilitary, extreme right-wing one having little to do with golems). The Jamambux is mentioned as a Satanist Japanese organisation in late 1930s American books about the occult. The creature, which the narration compares to Frankenstein’s Monster, was compounded of “desireable (sic) things”. Namely — Brute Force, Murder, Hate, Terror, Lust and Greed. This is reminiscent of Captain Marvel foes such as Sabbac or Ibac. This also gave the beast-man great power, as well as human-level intelligence. Captain Nippon was sent on several missions of sabotage in the US and elsewhere, occasionally along with his cohort Captain Nazi. He fought Captain Marvel, Jr. several times before disappearing in comic book limbo. In 1943, Captain Nippon destroyed the Empire State Building by chewing through the load-bearing infrastructure, which remains the high point of his career. 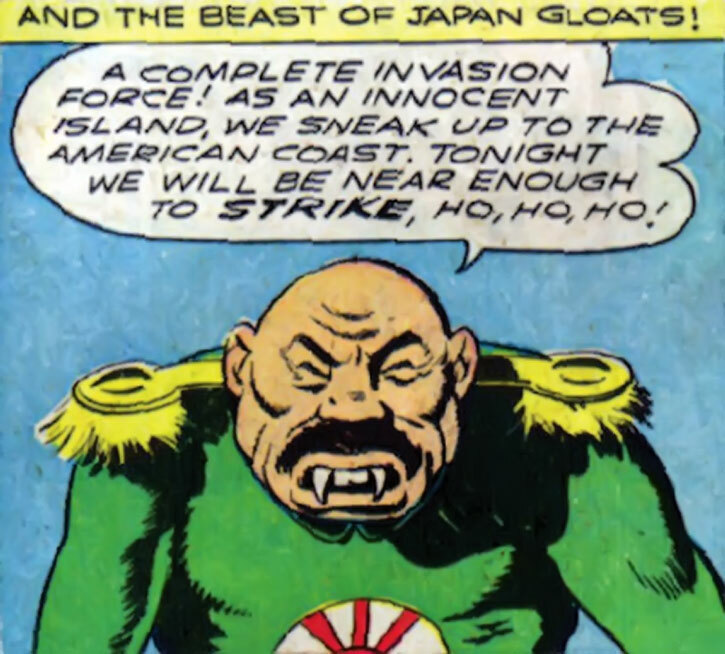 Nippon is evidently animalistic with fangs, a walrus-like moustache and an ape-like physique. At one point he even beats his chest like a gorilla. The most important thing is to cram the world “honourable” at least once in each sentence. Even if that makes absolutely no sense. In fact, it’s better if it makes no sense whatsoever and is appended to an inanimate item or impersonal phenomenon. It’s a crassly racist caricature. That’s the whole point of Captain Nippon ! His grammar is also approximative, and I would assume that he is a cringe-worthy stereotypical accent. 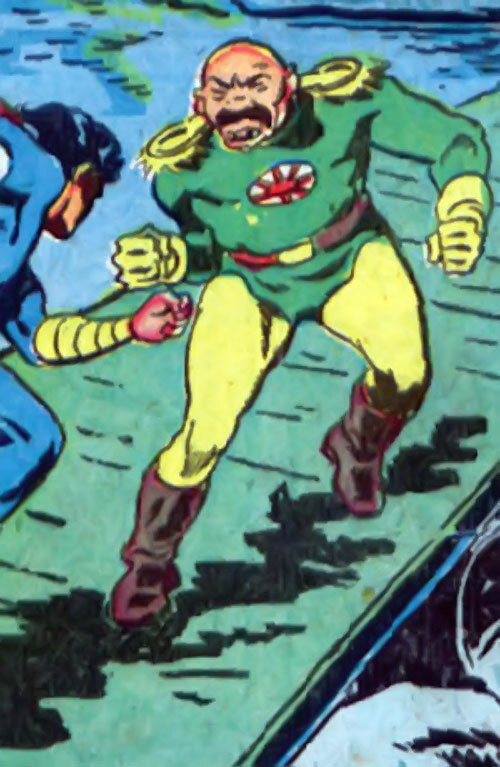 Like all Axis characters in Captain Marvel stories, Nippon is a bully and a coward. In his case, there are also vague Satanic allusions, with captions that equate Shinto faith with a worship of the Devil. Captain Nippon existed in a continuity that can’t even be really called Earth-S. However, if something along the lines of Captain Nippon existed on New Earth, odds are that it was created in a project led by the first Doctor Poison. One possible way to have a Captain Nippon that isn’t absurdly racist… mmm, let’s see. He’s a desperate weapon that gets built late in the war in the Pacific. It is a sort of super-zombie assembled from the corpses of several exemplary Japanese infantrymen who charged US troops with live grenades on them, and managed to kill and maim many times their number. Obviously it’s not a pretty creature. But it’s empowered by the then-current and official of heroism. We could even have it named after the initials of the soldiers’s family name, each soldier embodying a specific value, so it spells “Shimpu”. At least in English and for propaganda purposes, of course. So we still have a super-golem empowered by distinct virtues. And it still comes across as not-a-good-guy and monstrous in appearance. But it’s not… actively bad. The destruction of the Empire State Building may have been a retaliation for the LeMay incendiary raids of 1945 . It is also possible to strip the character down to his basic role and then reinsert him where it makes sense. For example, Captain Nazi and Nippon could have been created by another one of the experiments combining magic and science from the Dragon King and used as saboteurs in the US or to drive the rituals involving the Holy Grail and Spear of Destiny. In a Marvel or amalgamated campaign, perhaps the Red Skull was involved in some way. One last possibility would be to add them to Axis Amerika to beef them up enough to be a viable threat to a JSA with Captain Marvel, Black Adam and/or Kingdom Come’s Superman mixed in. You could even mix the two ideas since most of Axis Amerika’s members don’t have much of an origin story. Language (Japanese), Rank (Captain — Imperial Japanese Army), Misc. : Captain Nippon can use his full STR when biting through hard materials. Imperial Japan (Low), Captain Nazi (Low). The stats above are for most of Captain Nippon’s appearances, where he’s very much like his ally Captain Nazi in terms of abilities. 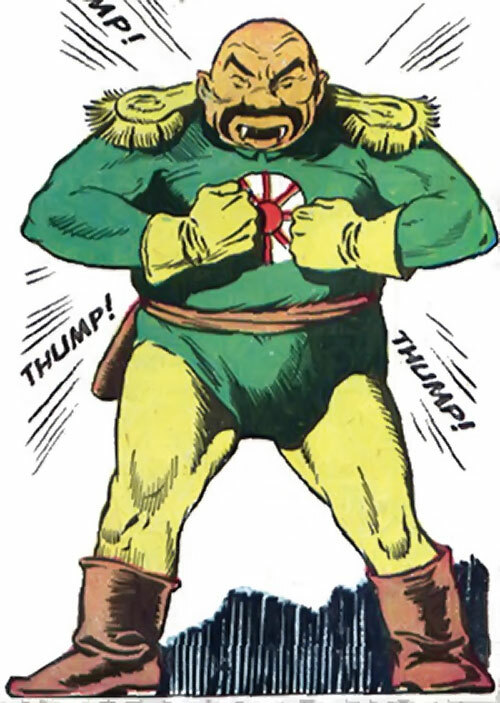 However, during his very first appearance, Nippon had a different look, different abilities, and was actually able to stand up to a Marvel rather than act as the typical super-mook a Marvel can defeat in one punch. This was only true for his very first appearance, though. Hero Points climb to 080, and are used in a tactically sound way. He still tends to favour LDD – but boosting RV is now a viable tactic. Especially since the Marvels almost never boost their EV by more than a few points as they’re so used to being way more powerful than their foes. Captain Nippon wields a sort of Spiked Steel Club [BODY 20, EV 03 (23 w/STR)], presumably made of some super-metal. If he has access to the resources of his creators, Captain Nippon can produce an Omni-Artefact with up to 15 APs of power. The one documented case being a severed gorgon head with Mystic Freeze. Captain Nippon also wears a standard Imperial Japanese Army uniform at this stage, complete with helmet. Source of Character: Fawcett comics in the 1940s (specifically Captain Marvel, Jr.). Writeup completed on the 30th of December, 2010.